As a kid, I don't think I ever dressed up and went trick or treating. I always just stayed home and helped hand out candy to all the kids who came around, which I really enjoyed. I've never liked the "scary and creepy" stuff, or really costumes in general. But then I don't know what happened, something changed after having kids. 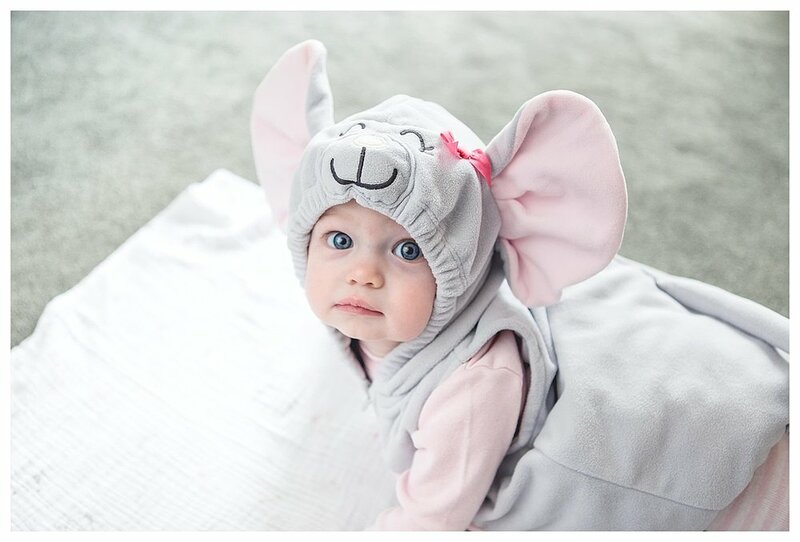 Maybe I just realized how stinkin' adorable babies and toddlers are in little costumes. Last year, one of Matt's friends gave us a Jedi costume for Ellie, and it was so big on her I knew she'd easily still fit in it again this year. Fortunately, I don't think Star Wars ever goes out of style ;) For Andie's first Halloween, I found the cutest little mouse costume at The Growing Place Consignment. I seriously love that place, I always find the cutest stuff in great condition. So of course, in mom photographer fashion, I had to take a ton of pictures to document possibly the cutest thing I've ever seen. I can't get enough of her big smile, especially now that she's showing off all those teeth she's been working on the past several months. And speaking of teething, apparently we're not done yet for a while... Thank goodness for all these little teething toys we have scattered around the house, they're never far out of reach for when she needs something to gnaw on, which is pretty much all the time. As a photographer, I sometimes feel conflicted when deciding which images to keep, when it comes to out-of-focus or not-so-great quality pics. But really, when it comes to images like this, there's no question I'm keeping them, for their sheer cuteness factor. Time to get ready to go out! Yep, I think there's a good chance it will still be big enough next year. :) Of course, it's nice having those sleeves be extra long on her to keep her little hands warm when it gets really cold after sunset. It's so funny to watch Ellie's progression from year to year. She was so into trick or treating this year, from the moment she woke up, the first thing she said was, "I can't wait to go trick or treating this evening!" But she's also maturing in her reasoning skills. Her first year out, when she was about 15 months old, as soon as she saw something shiny, which happened to be a peppermint patty, she latched onto it, and insisted on carrying it with a death grip the entire time. Fast forward 3 years to this year. We had gone about halfway around where we planned to go and we needed to stop back at the house to get mittens for Andie, so Matt suggested we put the candy she had gotten so far in the house, so she would have more room in her bucket for the rest that she was going to get. She was actually totally fine with that, knowing that it would sit and wait for her and not just disappear once it was out of her sight. It's so amazing watching them learn simple things like that that we take for granted.